Slim, tailored, or regular cut suits all have different defining features. Getting clued up on what each of these terms mean will make any suit buying journey much smoother. Our Skinny Fit Suits have slimmer lapels and a slightly shorter length jacket, compared to slim fit. The trousers that are slim however through the leg and hem. This close-fitting style is our narrowest fit of all our fits, creating a sharper, contemporary silhuoette. Moss London is our Skinny Fit brand, consider this when purchasing. Our Slim Fit Suit Jackets have slimmer lapels with narrow shoulders. 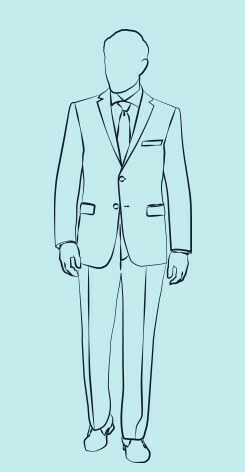 The suit jacket is shorter in length, the chest, waist and sleeves are narrower. The suit jacket tapers in on the waist to give a slim silhouette, the suit trousers are narrower on the leg and the hem should rest on the top of the shoe. You may consider going up a size when purchasing your first slim fit suit, jacket, coat or trouser. Our Tailored Fit Suits have standard lapels. 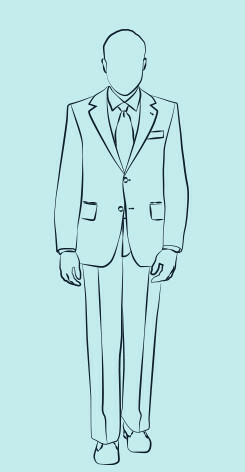 The suit jacket nips in on the waist and the jacket is mid-line in length. 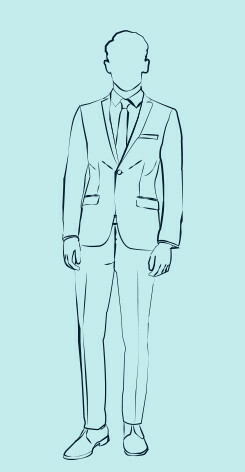 The tailored fit suit trousers are lightly tapered and the hem should rest on the top of the shoe. This cut offers a smart and flattering look which sticks to the core rules of tailoring. Our Regular Fit Suits have standard lapels with wide shoulders compared to our slim and tailored fit jackets. The jacket fits looser round the waist and is longer in length. The suit trousers are cut straight, ideal if you prefer more flexibility. 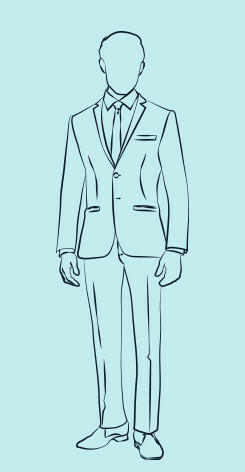 The suit trouser hem should sit lightly on the shoe. This is a classic everyday suit which allows more room for an easy fit.